Who’s that Girl with her Ferragamo Bag? Why so serious Salvatore Ferragamo? I suppose my thinking of this bag as being too structured and too serious goes hand in hand with the fact that my job does not call for me to dress up in a skirt and jacket or anything formal. EVER. I think if someday I needed to put on a pant suit I would quit. Ok that is a lie, because I sort of adore pant suits. But there is something too proper, too structured, and too refined about the Salvatore Ferragamo Gancini Icona Vitello Tote for my taste. The Boston Bag shape is a highly used and coveted shape year after year. Gucci has made the term Boston Bag famous, but it is not just Gucci that designs a bag of this shape. And this Spring designers are implementing this easy day bag shape in various ways. We simply do not talk about Salvatore Ferragamo enough on PurseBlog. But Ferragamo bags deserve more praise. I do not see them popping up on websites as often as I would like. Can the buyers change that, please? Ferragamo is known for high quality craftsmanship. The designs may fly too far under the radar for many though, which is why we don’t see more Ferragamo bags. Salvatore Ferragamo is one of those brands that flies under the radar for so many of us. But it shouldn’t. 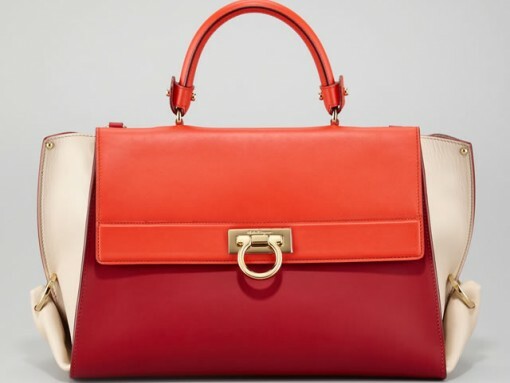 Time and time again I find Ferragamo bringing us the most delectable bags. They are simple, understated, and elegant but there is always a wow factor. 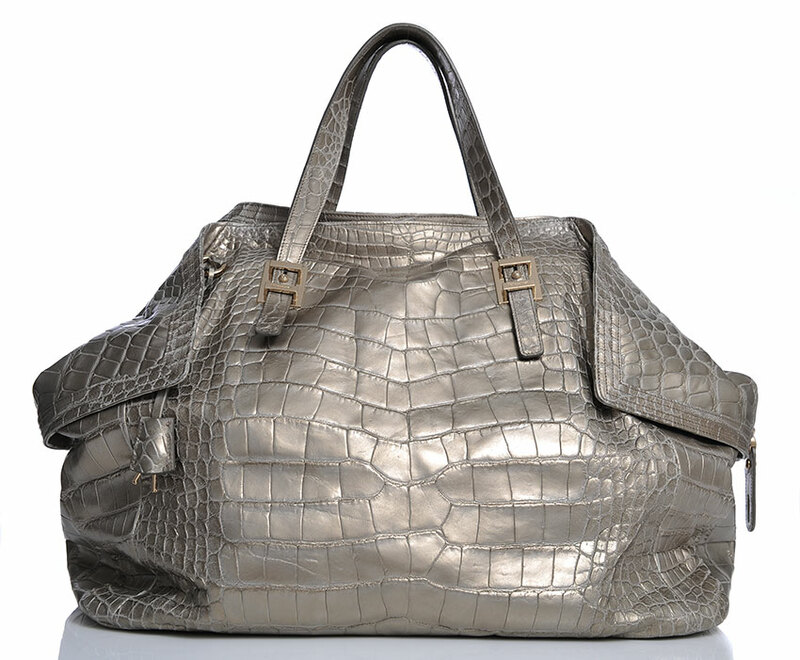 I will always reference the Ferragamo Carlotta, an oversized alligator bag that exuded brilliance with its exotic skin and shape. 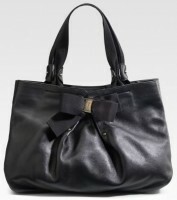 Next up on our Ferragamo love list, the Salvatore Ferragamo Gathered Leather Hobo. From the moment I laid eyes on this bag I adored it. The red leather is showcased by gentle pleating. 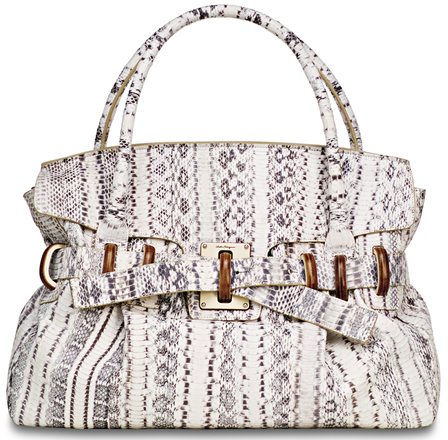 The chain link leather handle has a finely crafted twisted strap, which is the wow factor on this bag. 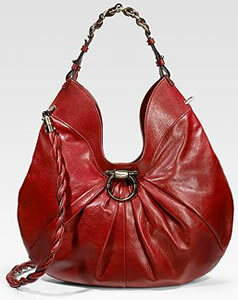 This bag is great in red, but Ferragamo also has a black version which Eva Mendes was spotted carrying in Italy. Every handbag collection needs a vivacious red bag and I find myself wanting to add this piece to my collection. Quality and craftsmanship is superb on Ferragamo bags. 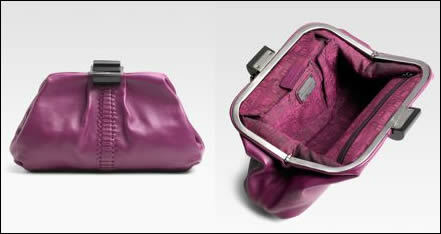 The inside features a zipped and two open pockets. Overall measurements are 16Â½”W X 15″H X 3Â½”D. Buy through Saks for $1,790. This bag is not playing around. 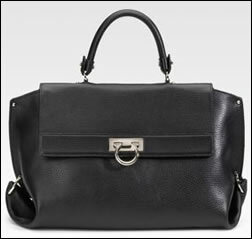 The Salvatore Ferragamo Top Handle Satchel means business, and it’s not going to put up with any of your flack. 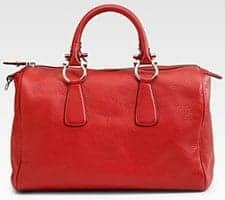 It’s an office bag if I’ve ever seen one, and although it evokes thoughts of the Hermes Kelly, it’s not iconic in a way that would tell all of your coworkers exactly how much you spend on your accessories. This kind of discretion is recommended by some in the current economic climate, but I’m just recommending it because I think it’s an interesting bag. The design isn’t totally buttoned – up; its structure is sleekly post-modern on the side gussets, and the hardware that holds it together is something I’d like to see in person. What we have here is a reimagining of a classic shape that’s office-appropriate without being obvious and interesting without being odd. Buy through Saks for $1890. When I think of Ferragamo I think of the absolutely drool-worthy Salvatore Ferragamo Oversized Carlotta Alligator Tote. I dream about that bag. I yearn for that bag. I feel as if I absolutely need that bag. But there is a tiny thing called reality, that sets in and tells me, YOU ARE NUTS! The $35,000 price tag really is out of my league and if I thought buying a Birkin was nerve-wrecking, this would most likely end with my passing out. What I realized about Salvatore Ferragamo bags after reviewing the Carlotta is their beauty. We all know their shoes, and many women swear by them. And now I can imagine many women swearing by their bags. The leather is supple, the craftsmanship is impeccable, the look manifests understated elegance perfectly. Take the Salvatore Ferragamo Sartoria Pebble Calfskin Clutch for example, which is dressed up with a handwoven accent down the center of the purple leather framed clutch. There is a black lucite closure, which is an unexpected addition. The clutch is a good size, 12Â¼”W X 6Â¾”H X 2Â½”D, and I adore the overall feel. And with a sale price of $714 (marked down from $1,190) the price tag is much more friendly to my wallet and the amount of money I am willing to spend. Buy through Saks for $714. Salvatore Ferragamo may be known for shoes, but the new line of handbags has me swooning. Not just a little bit of love, but there is a heavy amount of lust, or yearning, of floating on cloud 9. Part of the problem that many of us face with Ferragamo handbags is that we do not see the full line, the entire array. If only there were the entire collection available at Saks or Neiman Marcus, I know the sales online would sky rocket.